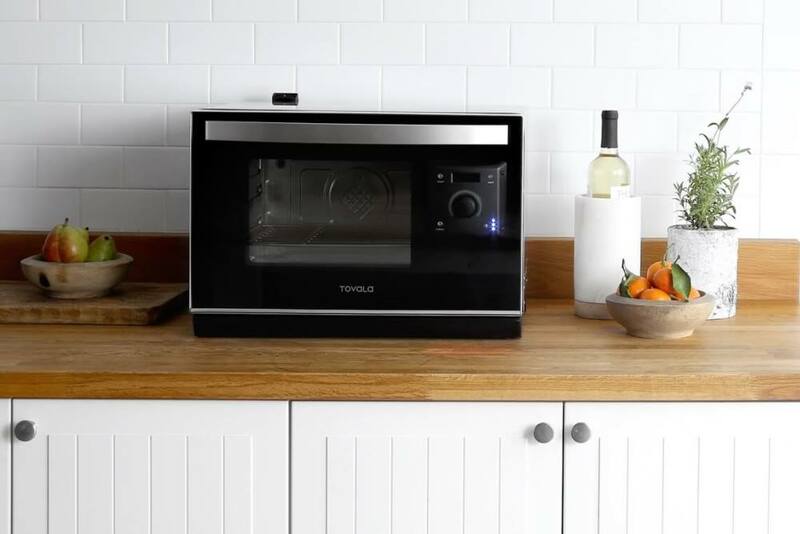 Tovala is an internet-connected steam oven and fresh meal delivery service that makes healthy and delicious meals as easy as scanning a barcode. Chefs create the Tovala Meal recipes, which are globally-inspired dishes with bold flavors. You can either use their recipes to cook your food with one touch, or make your own recipes and program Tovala to cook however you want, even using multiple steps. A production facility preps Tovala meals for customers, including pre-cooking certain ingredients so customers can simply press a button to cook their proteins, vegetables and grains all at the same time. Meals are delivered to customers’ doorsteps. They scan the barcode accompanying each meal, press start and, in 20 minutes or less, the meal comes out ready to enjoy. Tovala gets its data from the cloud when the barcode is scanned, telling it how to cook each meal perfectly. It also sends a phone notification when the meal is ready. The app allows Tovala to harness the power of customers’ smartphones to keep its interface simple without reducing functionality, making it easy to build complex recipes, cook with chef-selected presets and view cooking progress from anywhere in the home. Tovala can also push firmware updates so its functionality can be constantly improved according to customer feedback. The team behind Tovala wants to make it easier for people to eat better. That’s why they have created unique and fresh meals for customers to enjoy with zero prep on busy work nights. Tovala prepared meals serve up to two people, making it ideal for couples. All meals contain 400-800 calories and use tried-and-true cooking methods with some sequence of steam, convection bake and broil. Tovala can also cook anything that can be cooked in a conventional oven or toaster oven.